Fantastic 3 bedroom property in excellent location withe outstanding views over towards Arthurs seat. The property has been freshly painted throughout. The property comprises good sized front facing living room, to take advantage of those fabulous views. The living room has stripped wooden floors and neutral coloured walls. The room is comfortably furnished with a feature gas fire. The kitchen has a great selection of units and all appliances in place. There is plenty of work space to be able to prepare meals. There are 2 large double bedrooms, and the master has an ensuite shower room. Both rooms are freshly painted and with neutral floorings and are well furnished. There is a smaller 3rd bedroom which is a single. The bathroom maximises the space and has a 3 piece white suite with shower over the bath. The property benefits from GCH, double glazing and communal shared gardens. There is street parking. 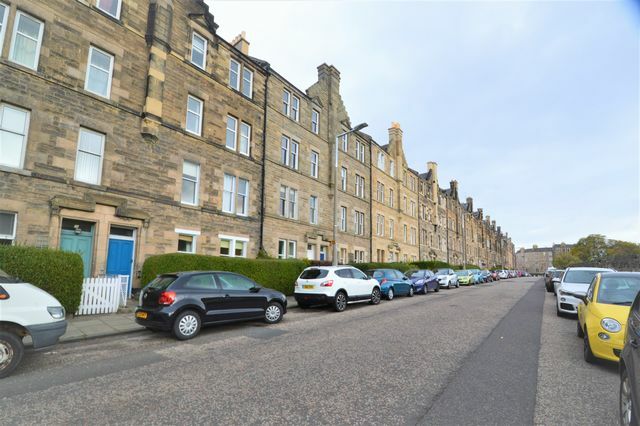 Royal Park Terrace is in a fantastic location, close to the centre, yet with Arthurs Seat on your doorstep to take advantage of the large green space in the heart of the city. There are great transport links both in and out of Edinburgh and close by you will find a selection of local shops along with larger supermarkets in the Meadow bank retail Park.